Open playonline viewer (NOT ashita/windower - open POL directly). 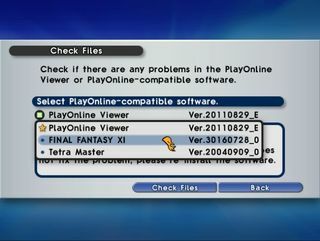 Select "Check Files" but and then "Final Fantasy XI" don't begin yet. If an installer window comes up, just cancel it. Go back to that POL viewer you still have open (You DO still have it open, don't you? If not, slap yourself and return to step 1 ! ). Start the file check. It will check your local files, see 0.dat is missing, then report that it found 1 problem and ask to fix it. Go ahead and ok that, and it will recheck your files AGAIN except this time against the latest version on SE's servers. When that finishes it will finally begin updating. Ain't SE's update system grand? /sarcasm. DISCLAIMER: Removing rom/0/0.dat has worked for thousands of people without issue. Not all files get found and replaced by SE's process, so do not listen to anyone telling you to delete a different file. These instructions have always worked if they were followed correctly. I cannot be held responsible if you screw up your client and have to reinstall from scratch. Last edited by TeoTwawki on Sat Aug 18, 2018 2:25 pm, edited 3 times in total. Re: How to Force-Update your client in 5 steps. Deleting random files can have adverse side effects as NOT ALL FILES will properly update if you delete them. A handful of people have stated in the past that some of the older game files will not properly update from the server, or wont update at all. This file has always worked for me and has never given me a problem. It is always replaced by the updater and the client works fine.